SOUTHINGTON - Jacob Drena couldn’t have drawn up a better way to silence any doubts about him. 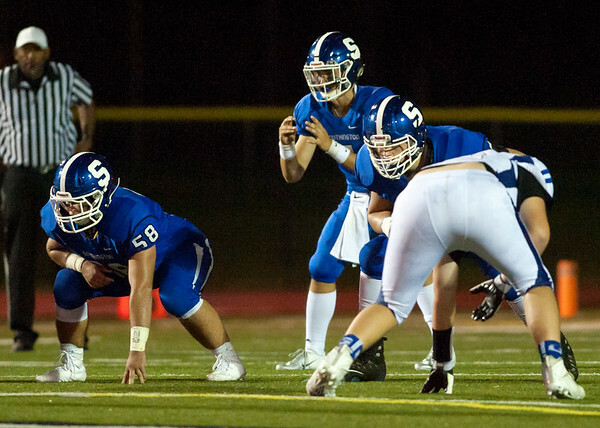 Despite having never started a game heading into the season opener against Glastonbury, the senior quarterback for the Southington football team played like a veteran in the 41-7 rout. For the most part, Drena looked poised, calm and in charge. Even with the end result, that pressure did seem to get to Drena early on. His first throw of the game was a lazy pass intercepted by Glastonbury at midfield. As early as it was, it was a defining moment in the quarterback’s season, one he may not have bounced back from without the help of his team. The senior responded in a big way, delivering a dominating performance with 356 yards passing and five touchdowns. But after the game, Drena accepted little credit, instead shining a spotlight on the effort his receivers gave. Jacob Flynn caught five passes for 179 and three touchdowns, while Will Downes caught four balls for 136 yards and two scores. The receivers are just a small part of a veteran offensive group surrounding the signal caller. The Blue Knights have seniors starting at every unit, which head coach Mike Drury said will play into his squad’s favor, especially later in the season. Though Drena had not started for the Blue Knights before Friday, his familiarity with the players on the roster was key to team’s success. He said he has been playing football with most of the players on the roster since third grade. Drena knows bringing the state championship back to Southington for the first time since 2014 will be a difficult task, one that will require him to be at the top of his game, day in and day out. With Drena under center for the Blue Knights, there’s no reason to think a championship is out of the question. Posted in New Britain Herald, Southington on Tuesday, 11 September 2018 21:15. Updated: Tuesday, 11 September 2018 21:18.